Tentatively observed – a boson "consistent with" the Higgs boson has been observed, but as of July 2012, scientists have not conclusively identified it as the Higgs boson. ↑ Note that such events also occur due to other processes. Detection involves a statistically significant excess of such events at specific energies. 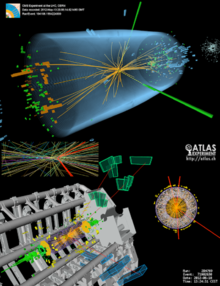 Video (04:38) – CERN Announcement of Higgs Boson Discovery (4 July 2012). 2001, a spacetime odyssey: proceedings of the Inaugural Conference of the Michigan Center for Theoretical Physics : Michigan, USA, 21–25 May 2001, (p.86 – 88), ed. Michael J. Duff, James T. Liu, আইএসবিএন ৯৭৮-৯৮১-২৩৮-২৩১-৩, containing Higgs' story of the Higgs boson. Why the Higgs particle is so important!